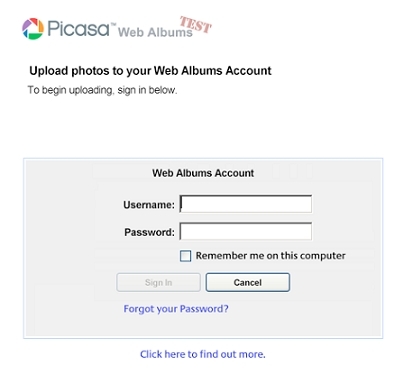 After Google launched Picasa Web Albums yesterday, I quickly signed up for limited test. I received my invitation this morning. Here, I write my experience on using Picasa Web Albums for the very first time. Upon receiving my invitation, I was required to click on a link that brought me to an agreement page with the typical "I agree" button. Then, after logged in with my Gmail account, I don't see any page for me to upload images. I was required asked to download Picasa software (4.6MB). I suppose Picasa software is the only way to upload images to Web Album. You may choose to upload your images through Picasa or the old style browse and upload method, although using Picasa will save you a lot of time. You will see this link at the top right of your Picasa software. Choose your desired upload size then "OK". Alternatively, if you want to upload via web browser, create an album then upload. Take a look at this sample album, or my album. So, after looking at the steps, what do you think about Picasa Web Albums? Looks troublesome. I used Picasa for about 5 minutes before uninstalling it because it was rubbish to me. But the option for upload quality is a nice feature. It’s troublesome if you are not using Picasa to organize your photo. It’s an add-on if you already been using Picasa all the while. Btw, I see a limit of 250MB upload size. Forgot to mention about it. Umm.. I didn’t notice that you can also upload your images through the web interface — the old style browse and upload method. You can do that after you created album. I have no problems with Picasa. I think this is one of the best (if not THE best) and nicest picture catalog software.